artnet Auctions is proud to feature the first single-artist sale of photographs by Frank Horvat (French, b.1928). This exceptional sale contextualizes Horvat’s impact and career, and provides the incredibly rare opportunity to acquire his unique “reference prints.” The 16 photographs that comprise the Frank Horvat Sale have an estimated value of US$87,000 to US$112,000. New York / Berlin / Paris, March 1, 2012—artnet Auctions presents the first single-artist sale of Frank Horvat artworks. This sale is exceptional in several ways: the 16 photographs contextualize the different periods of Horvat’s œuvre—one that constitutes an important milestone within the history of international Fine Art photography. Moreover, it provides an opportunity to acquire unique prints, known as “reference prints,” by the celebrated photographer. The ensemble of 16 photographs has an estimated value of US$87,000 to US$112,000. Each of the photographs feature women, as Horvat favors the female subject. Seven of the images are prints from negatives, well-known shots taken for fashion magazines or within the context of reportages. All but one of the photographs are unique prints created before their limited-edition releases. 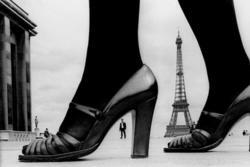 Amongst them: Shoe and Tour Eiffel (1974), published in Stern magazine (Est. US$5,500–6,500); Givenchy hat (1958), published in Jardin des Modes (Est. US$6,500–8,500); and Deborah Dixon and Federico Fellini (1962) photographed for Harper’s Bazaar (Est. US$5,500–6,500). Swinging girl (1962) appeared in a reportage shot in Cairo (Est. US$4,500–5,500), and Le Sphynx, self-portrait with stripper (1956)—part of a series about striptease commissioned by the American agency Black Star—is part of a limited printing of 30 photographs (Est. US$4,500–5,500). The nine other works in the Frank Horvat photography sale are older or more recent digital pigment prints—which enables the original contrasts and colors to be reproduced faithfully—and were made by the artist himself, in limited series of 30 in the A2 format (42 x 59 cm.) and 12 in the A0 formats (84 x 118.8 cm.). Evening gown (1989) (Est. US$6,000–8,000), published in L’Officiel, is amongst the last fashion photographs that Horvat shot, while two other photographs represent Horvat’s more experimental work: Sandrine (US$4,000–6,000) is part of a project entitled Vraies Semblances (1983), which principally focuses on women and the emotions that they inspire, and Cyane (Est. US$4,000–6,000) is part of the series, Les Métamorphoses d’Ovide (1996), portraying the love of goddesses and nymphs. Frank Horvat photography so defies classification that the artist likes to present himself as “the least-known famous photographer.” It is true that the eclecticism of genres and techniques in his work renders his labelling a difficult task: from his début as a photojournalist in the 1950s to numerous collaborations with fashion magazines (such as Elle, Harper’s Bazaar, Vogue, and Jardin des Modes) and his recent digital work. But regardless of category or subject, in black and white or color, on film or digital, there is a clear vision throughout. Horvat acknowledges having been influenced by icons such as Henri Cartier-Bresson (French, 1908–2004), August Sander (German, 1876–1964), and Irving Penn (American, 1917–2009), but the importance of literature in his outlook on Fine Art photography, and his reflections on the image and its context, result in an aesthetic quintessentially his own. When Horvat invented a new way of photographing models for his fashion shoots, he did so almost reluctantly. Being used to working with natural light, with his 24 x 36 camera over his shoulder, he would bring the models down into the street and photograph them in real life contexts, amongst the habitués of a neighbourhood bar, or alongside the residents of a small French village. Thereafter, his approach to photography drew from this experience. At the beginning of the 1980s, when an illness that affected his eyesight briefly forced him to put his camera aside, he threw himself into a series of interviews with notable photographers, such as Helmut Newton (German, 1920–2004), Sarah Moon (French, b.1941), and Robert Doisneau (French, 1912–1994), which became the basis of his Entre Vues collection. As early as 1989, he became interested in digital photography, and throughout the following decade, he made the most of what computers could offer. His curiosity about new technologies has inspired him to create an iPad application, Horvatland, which includes more than 2,000 of his photographs, paired with his own written notes or audio commentaries, enabling users to freely explore his work. Frank Horvat’s work has been exhibited at the most prestigious international museums, and his photographs are held by international art institutions, such as MoMA in New York, NY, and the Centre Pompidou in Paris. The Frank Horvat Sale is open for bids on artnet Auctions through March 8, 2012. View all lots at http://www.artnet.com/auctions/artists/frank-horvat/. Watch the artnet interview with Frank Horvat: http://www.artnet.com/magazineus/videos/frank-horvat.asp. With 24/7 worldwide bidding, artnet Auctions is the world’s first and only online auction platform to buy and sell Modern and Contemporary paintings, prints, photographs, sculptures, and more. artnet has been online since 1995 and is host to approximately 2 million visitors each month. Through the artnet Price Database of all auction sales results and artnet Galleries of all premier art galleries worldwide, artnet is the leading online resource for the international art market.